SEGA continue ‘mature game’ development for the Wii with ‘The Conduit’. Let’s see how it faired. The Conduit is a futuristic first-person shooter video game developed by High Voltage Software for the Wii console. The game uses a new game engine called Quatum3, which has been designed by High Voltage specifically for the Wii. It’s quite a well made engine judging by the game play as the engine allows a number of effects such as bump mapping, reflection and refraction, and gloss. It is a very good effort by High Voltage to bring the Wii experience as close as possible to that of a PS3 & 360; they have really pushed the Wii’s limits hard with this title. The story line follows a newly trained agent called Michael Ford who, while on a relatively routine mission to stop terrorism in the US capital, gets embroiled in a fire fight with an alien invasion. The alien race is known as the Drudge, and they use portal-like Conduits to teleport and deploy troops over Washington D.C. I’m not going to give any spoilers away with regards to what happens to Mr Ford. All I’m going to say is that it is a typical story line for a First Person Shooter. It works well and does the job. The story line is generally told through cut scenes between the levels. However, there are small plot enhancements inside the levels through communication with Ford’s bosses. In addition to this, there are television and radio broadcasts to look out for in the missions as these further enhance the background knowledge of the game. 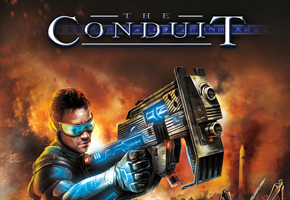 Apart from the run-of-the-mill FPS game play, The Conduit includes a unique feature called the ‘All-Seeing Eye’. This object is used by the player to uncover secrets hidden in the game, solve small puzzles as they go along, and detect traps as well as enemies. It’s a nice addition to the normal ‘shoot and kill’ aspect found in all FPS’s. The Conduit’s game play is reminiscent of Metroid Prime 3. In my personal opinion, the control system is bit more refined and solid than that found in Metroid. It seems that the developers has taken the best bits from Metroid and Medal of Honour Heroes 2, and in turn have steered clear of the poor attempt at FPS game play on the Wii that Red Steele produced. In fact, the controls are so detailed and well thought out that there is the option for the user to completely redefine the control configuration. Best of all is that these controls can be altered as you go along without even leaving the mission. However, I found that the best set up was the default. On top of the controller customization, High Voltage has also included a complete HUD customization menu. The user can move and place HUD elements on the screen wherever they please. Again, this can be done without leaving the current mission. I found that, again, the default way is the best way, however, it is very nice option to have included in the game. The game features all of your basic weaponry such as pistols, SMG’s, rifles, and grenades. In addition to these it also features a number of alien like weaponry that have a number of unique fire techniques. The alien weaponry follows the same line as Metroid’s main weapon where you can charge your fire for a bigger hit. All the guns feel good to shoot in game as the physics are generally well put together. The only problem I found on this was some slight collision detection problems with walls and bullets. So steer clear of trying to catch the thin edge of an alien round a corner. The last BIG feature of The Conduit is the multiplayer. It features 13 competitive modes in online play, with 7 different maps, and 15 weapons. The main categories are Death Matches and Team Based. Both categories have a number of sub-game modes such as “Three Strikes”, “ASE Football”, “Team Objective” (a ‘capture the flag’ like mode), and many more. Each of them are very enthralling and can be played with “Friends, Regionally, or with World Wide Players”. I found the online mode to be the biggest selling point of this game. Matches are started relatively easily and matches are very well balanced. After only 5 minutes of playing you will find yourself getting plenty of kills! A tip from me is to remember you do have grenades; use them, they are very helpful! The online game play also supports Wii Speak, although I am yet to find anyone using it. I have thought about investing in one, they aren’t that expensive on eBay these days. All in all SEGA’s second mature game for the Wii (after Mad World) has been a success in my opinion. I think FPS fans are going to be very happy with this title. I’m a big Counter Strike player and have found The Conduit a great and fun challenge. High Voltage haven’t created a revolutionary FPS title but have certainly put together the most comprehensible Wii FPS yet. Hopefully we will see more games like this from them in the future, but not just yet, as The Conduit will have you hooked for a few months yet!